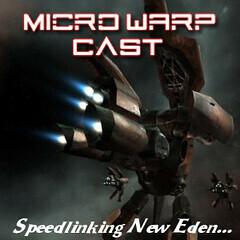 I've teamed up with fellow blogger YoMma, to put together a new EVE Online podcast. Yeah, I know, I'm nuts! The idea behind this project is to bring you the weekly Speedlinking News in an audio format. So for those on the road, who don't have the time to go through each weekly posts, YoMma and I come to the rescue with our audio version of your favorite EVE news round-up! As I write this, the show has been uploaded to VirginWorlds.com's Podcast Collective, the FortNox of MMO podcasts! So I'm anxiously waiting for the show to go live and for you to provide us with your feedback and opinion. I spent a few hours late last night, as well and a good part of today, editing and polishing it, adding music, and trying to put together a quality show. Hopefully, these efforts won't go to waste. If it doesn't turn out like we wanted, it's all YoMma's fault for getting me into this mess... ...kidding!!!! Splendid! Looking forward to listening to it! Good stuff. Glad to see you working on a new podcast. Is it planned to be weekly or what? It's amazing that you have time for EvE plus all these side projects and still have a healthy family. Kudos to you! You help bring energy to what is sometimes a stagnant playing environment. It's planned to be weekly, though since I'm currently not employed, that schedule might change when I do find work. I'll keep you all posted on that one! As for my ability to fit all this into my schedule, it's all a question of time management, and the fact that I only need 5 or 6 hours of sleep to recuperate.